No bland flavours over here! 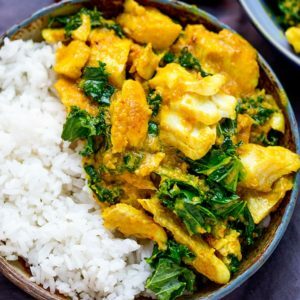 This yellow Thai fish curry is simple, delicious and speedy too! 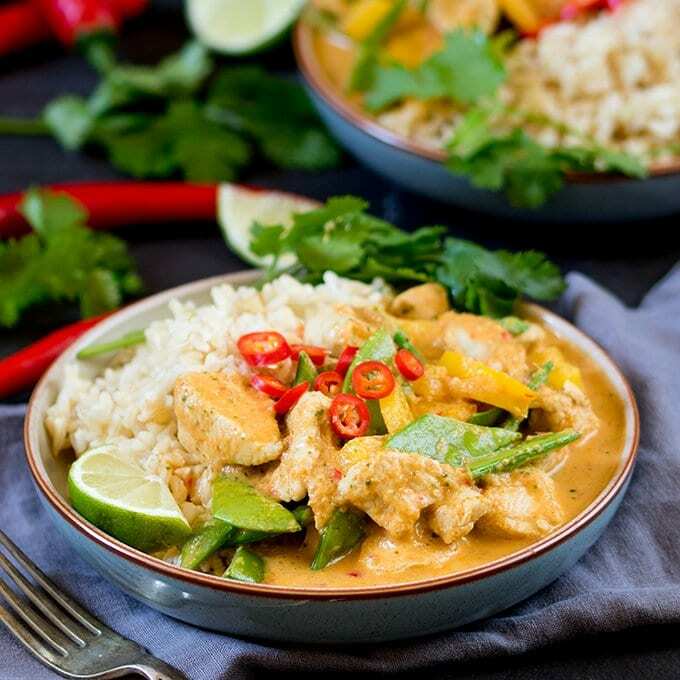 Plus the homemade Thai curry sauce is great for multiple recipes – I’ve included some ideas below. I often use ready-made pastes when I’m making a Thai curry, but it’s actually quicker than you think to whip up your own paste from scratch. Five minutes extra and a food chopper to wash – not too much to ask for a dinner that’s fresh and delicious (and also means you don’t have to put that half-used jar of Thai paste on the top shelf of the fridge along with the other 5 jars you forgot you bought! – guilty as charged). Half of this paste is spread onto the fish fillets, which are then fried. Then the remaining paste is added, along with coconut milk, stock and a few other goodies. Ooh ooh guess what! We’ve finely come to the end of our family summer diet challenge. We lost 80lbs (36kg) between the 5 of us over the last 10 weeks. Not too bad, considering we had 3 trips away during that time where we ate what we liked. Apparently that’s the weight of a medium sized cheetah! Now we’re on our own in the big, wide chocolate-and-donut-filled world, so I’m working on creating a go-to list of meals that are nutritious, healthy and quick to make when I’m hangry. Hopefully these meals will stop me from cooking up sinfully-delicious-but-naughty meals like this and this too often! 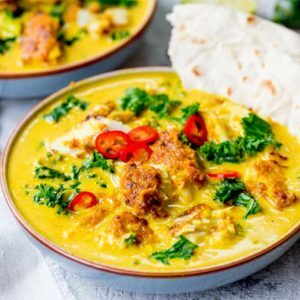 The paste for this Easy From Scratch Thai Yellow Curry With Fish is based on the recipe I use for my seafood laksa, but instead of using prawns and noodles etc, this time I’m adding kale to bump up the vitamins, and also rice. You can make the paste ahead or you can make the whole thing ahead. Cool quickly, then cover and refrigerate for up to two days. The fish won’t be quite as tender when reheated, and may break apart more, but it’s still delicious. Reheat in a pan over a medium heat until piping hot throughout. 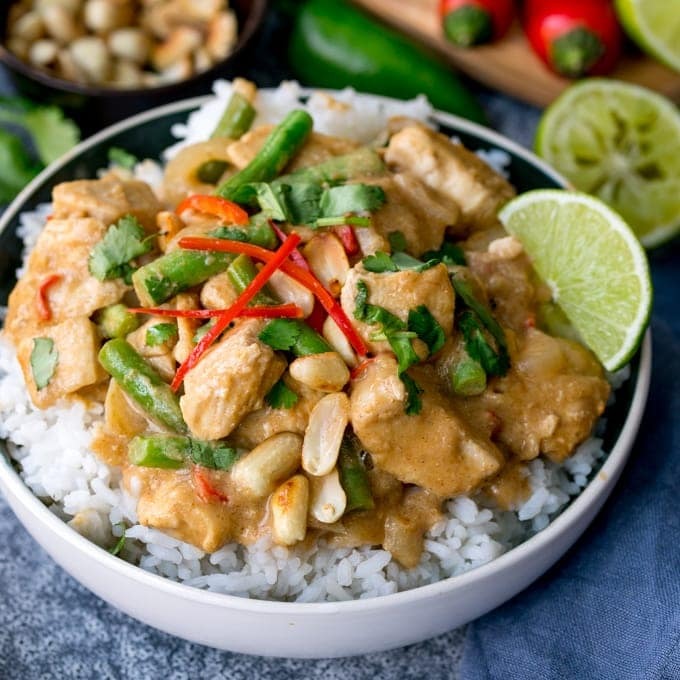 Don’t let it boil rapidly, as the coconut milk in the sauce may split. I prefer this dish freshly cooked, but it can be frozen. Cool quickly the dish, then cover and freeze for up to a month. Defrost thoroughly in the fridge overnight, then reheat in a pan over a medium heat until piping hot throughout. Don’t let it boil rapidly, as the coconut milk in the sauce may split. You may find the sauce is thinner after defrosting. Stir in a little cornflour/cornstarch and cold water slurry (1 tbsp cornflour/cornstarch mixed with 3 tbsp cold water) to the hot sauce until thickened to your liking. No bland flavours over here! 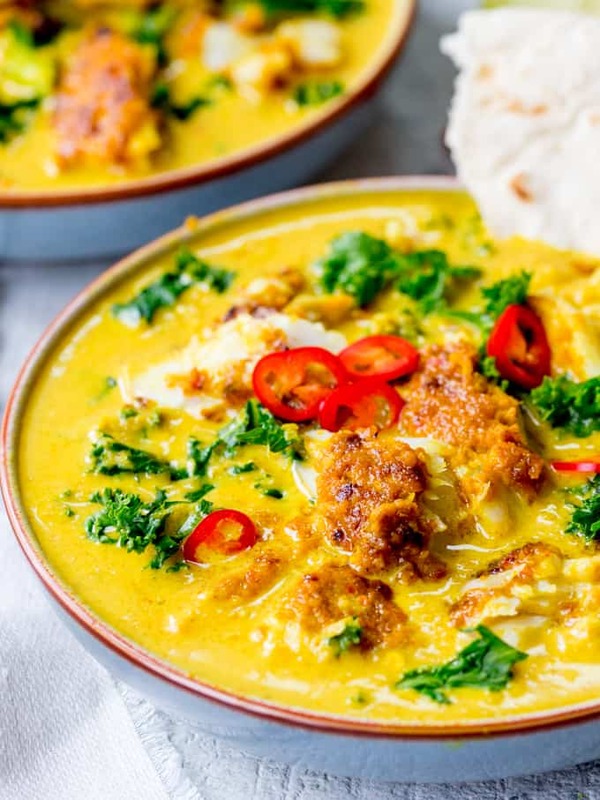 This Yellow Thai Fish Curry is simple, delicious and speedy too! This is my Easy From Scratch Thai Yellow Curry With Fish. 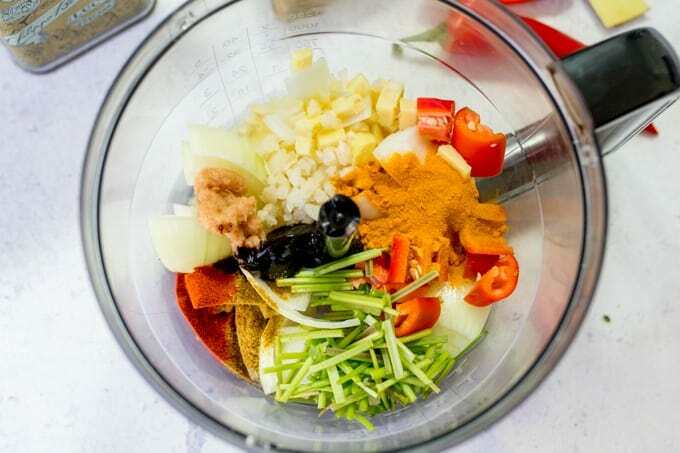 Add all the curry paste ingredients to a bowl and blend together using a hand blender until no lumps remain (or use a mini chopper). 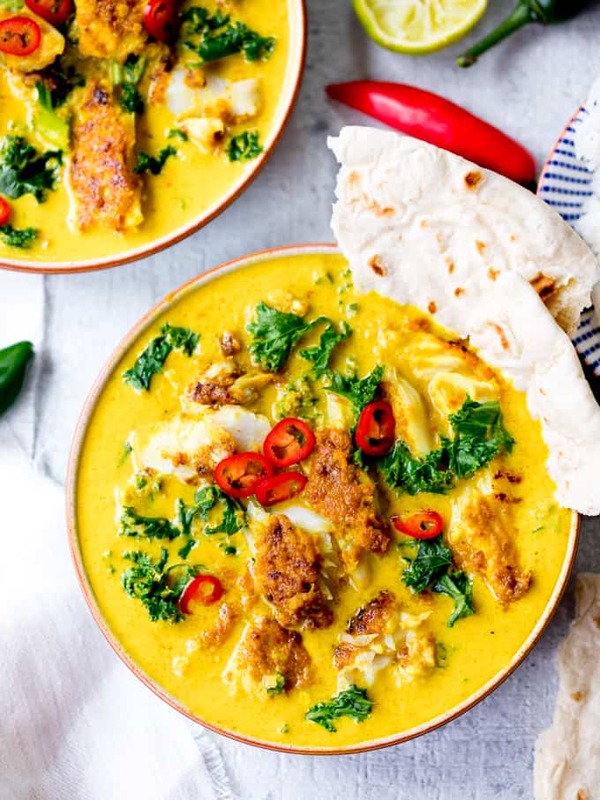 Spread half of the curry paste on the haddock fillets (both sides, or just the fleshy side if the fish still has skin on). 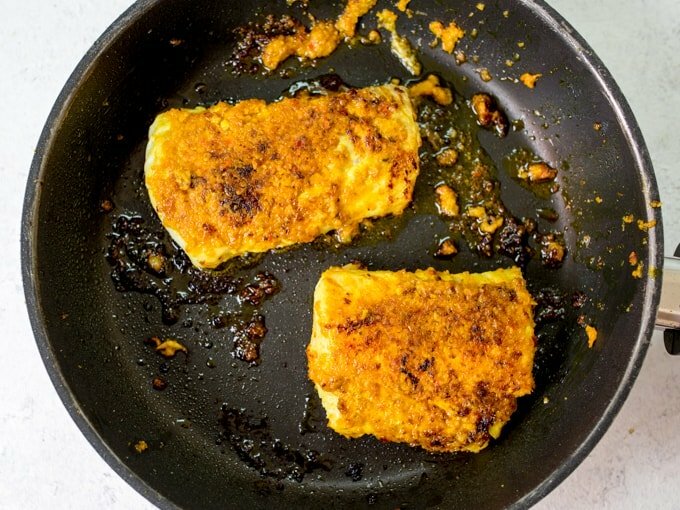 Heat the olive oil in a large frying pan (skillet) on a high heat and place the haddock fillets in there. Cook for 2-3 minutes on each side until the coating starts to brown. Add the rest of the curry paste to the pan and cook for a further minute until fragrant. Add the coconut milk and stock, then stir (you can remove the skin from the fish at this point if necessary), breaking up the fish a little. Once the coconut milk is bubbling, add fish sauce, brown sugar and lime juice and stir again. Test for seasoning and add a little more salt/pepper/lime/sugar if needed. Add the kale and stir through for 1-2 minutes until wilted. If you'd like the sauce to be a little thicker, stir in the cornstarch and water mixture a little at a time until the sauce is thickened to your liking. Serve topped with sliced chillies and some boiled rice if you like. We also like to serve ours with toasted pita (make sure it's gluten free pita if needed). The fish won't be quite as tender when reheated, and may break apart more, but it's still delicious. Reheat in a pan over a medium heat until piping hot throughout. Don't let it boil rapidly, as the coconut milk in the sauce may split. I prefer this dish freshly cooked, but it can be frozen. Cool quickly the dish, then cover and freeze for up to a month. Defrost thoroughly in the fridge overnight, then reheat in a pan over a medium heat until piping hot throughout. Don't let it boil rapidly, as the coconut milk in the sauce may split. You may find the sauce is thinner after defrosting. Stir in a little cornflour/cornstarch and cold water slurry (1 tbsp cornflour/cornstarch mixed with 3 tbsp cold water) to the hot sauce until thickened to your liking. This recipe was first published in May 2016. 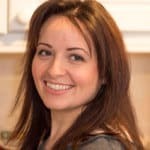 Updated in July 2018 with new photos, additional tips and a few minor upgrades to the recipe. Here’s one of the old pic in case you’re interested! I need this curry in my life. 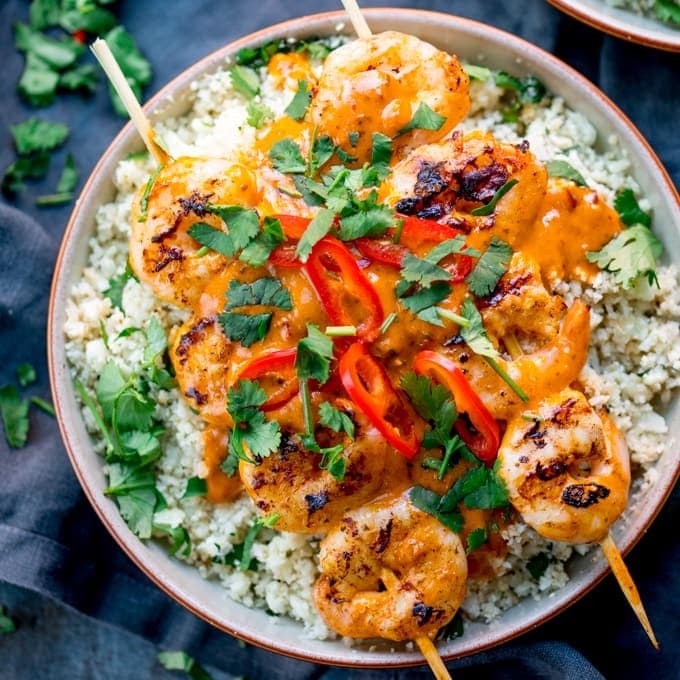 I’m a sucker for shrimp and always have a bag in my freezer, so this is totally perfect for those. 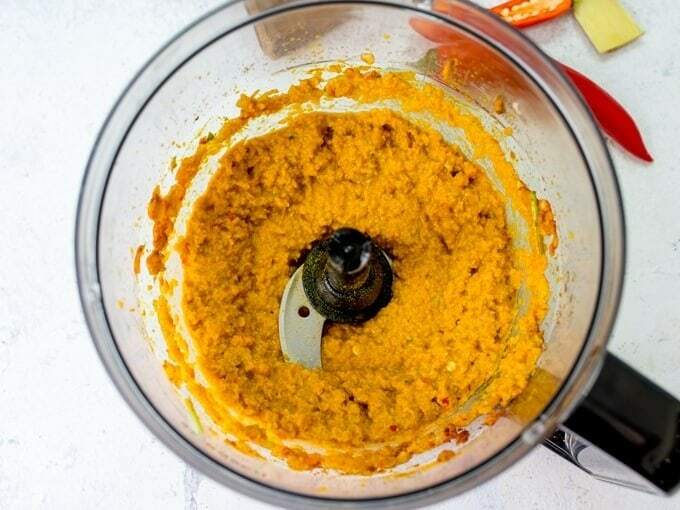 I love the flavor of fresh homemade curry paste too! This sounds just incredible Nicky! 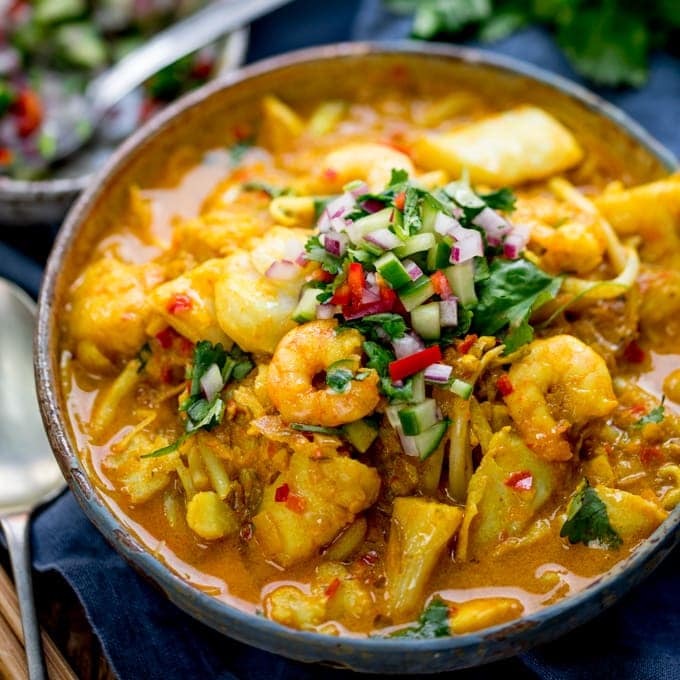 Love fish curry ! Thank you for your version ! Fabulous, quick, easy, tasty midweek meal. We try to eat fish once a week and this is being added to our meal plan.